cats win set 3 25-14, and the match 3-1. came out strong, went up 5-0 and never looked back. way to close it out, ladies! play the winner of coastal carolina and arky state tomorrow at 2p. Watched the 4th set. Maybe I'm good luck. I should tune in tomorrow. damn - cc has some legit athletes. they have 2 back row attackers and most teams might only have 1, if that. cc up 1-0 after txst couldn't hold a 2 pt lead in mid teens. 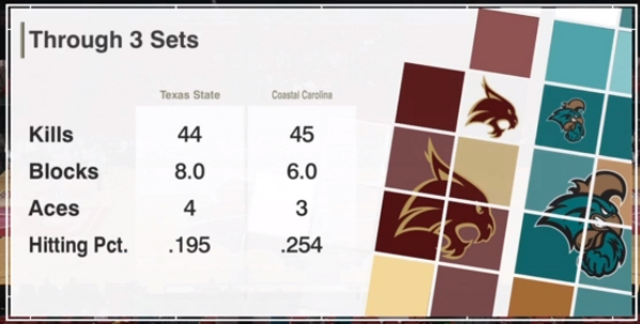 bobcats make a nice run in the mid teens to go up 6, cc battles back to 24-23 before txst closes out at 25-23.
madison daigle w/ a hell of a set. just everywhere. would like to see more bolden going forward. on the bright side, the bobcats bring back an incredibly balanced team next year. think they only lose 2 contributors to graduation. ...and apparently there's a volleyball nit that we're going to instead of the ncaa tourney. never heard of that one...have we gone to it before? agree, looks like it's coming back with an expanded field(64 teams per 1 site) to mimic the nit basketball. Also, games will be played at participating schools, so Lady 'Cats may get to host a match or 2. Great opportunity for team to practice more, get more game exp. and get more exposure. Yeah I like these secondary tournaments for where we are currently as an athletic dept. (struggle to make NCAAs with much frequency). I enjoyed the CIT last year in basketball. Those extra games against some unfamiliar opponents should help improve the team with the additional practice time and experience. Not that I'd prefer this over the NCAAs, but we probably do have a better shot at going on a run as opposed to getting sent to Austin to try and get by the #2 dongwhorns also. Yes, NCAA is preferable, but this is next best thing. Also rewards the kids for doing great job during regular season. Might also get student body to show up if host a few games into the later rounds of tournament. i'm a fan of the extra practice and matches, but it's definitely a bummer to not have won the conference, even if only to be served up as 1st match fodder in austin. that's a team we swept, at their house, at the beginning of our big run. not sure that cc could have played any better yesterday, but i think we could have, so hopefully the ladies bring it 100% and make a run at winning the nit. curious to see what the field looks like - imagine we match up pretty well.